This will be a quick one as I am simply exhausted, and I need to go and collect Marmalade from the Vet shortly as she was in getting spayed (God love her). I am exhausted because I was working 2 nights off one and in for another 2, I finished this morning and I couldn’t face doing the essentials around here, never mind a workout 🙁 Sad, but true – the energy and ability to workout, does reach a limit, so I need a little rest. This workout was filmed on Saturday, after the first block of 2 nights, and I thought I was tired then LOL! Still I managed to do this really difficult workout as I failed, yet again, to go to the gym after work. I really really hope I can snap out of this lull, as I just feel the dark days, cold weather and all this change has really impacted on my motivation. With so many plans and goals, and so many eyes watching, I feel like I have so much to do, but no time to do it. Please tell me this is not just me?? I know I could do so much better here and in my training if I didn’t have to work, but if I didn’t work – none of this would be possible. It’s a catch 22 I guess. This workout is body weight only (bar a couple of stability ball exercises). It is interval training and 20 minutes long. This is a tough one guys – make no mistake. Two rounds of 10 exercises. 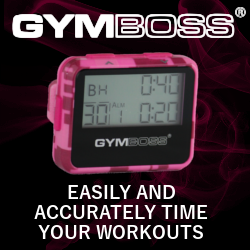 Set your Gymboss Interval Timer for 20 cycles of 15 seconds recovery, and 45 effort. I have indicated, in brackets, both my reps per exercise and each exercise’s focus with my nifty “key”. As in, cardio (c), strength (s), resistance (r), plyometric (p), stability (st) or core activating exercise (cae). What a great variety of exercises, working nearly every part of the body, in different ways! Challenging and effective. As I said in the video, flexibility is my weakness, and I really want to get better at pistols again (Melissa has motivated me to do this). My strength has definitely improved, but strength is not complete without flexibility. As I intend on doing my Olympic Weight Lifting Course next March, then I need to get my finger out and start working on my weakest link! OK everyone, that’s it for today, I will be back soon with more. In the meantime, let me know if a) you liked this workout b) if you find sometimes you lack energy to train, how do you combat this? I would love to say that I have a magic cure, but I don’t – I suffer just like everyone else. After all, this is why I started this blog, because I wanted to show the REAL LIFE struggles we ALL face. When I get disheartened, my diet suffers, so I am so scared of undoing all my hard work – and I don’t want to let anyone, especially myself down!